Is it possible to recover from a spinal chord injury when your doctor says you will never walk again? When Philip Devitte was just 27 with his whole life ahead of him, a car accident left him paralyzed from the waist down—for life, according to his doctor’s prognosis. Married to a beautiful wife, he was also told he would never be able to have children. But Philip Devitte refused to accept his doctor’s dire prognosis. Something deep inside him, “a knowing beyond knowing,” assured Devitte at the core level of his being that he would walk again. “It wasn’t denial,” he says. It was something he firmly knew beyond a shadow of a doubt. Despite his doctor’s constant negative warnings that he was in denial and setting himself up for disappointment, Devitte was so determined to walk again that he fired his doctor, surrounded himself with positive people who would help him achieve his goal and equipped himself with the most important tools in his arsenal: faith, willpower, determination, alignment, discipline, flexibility, and patience. 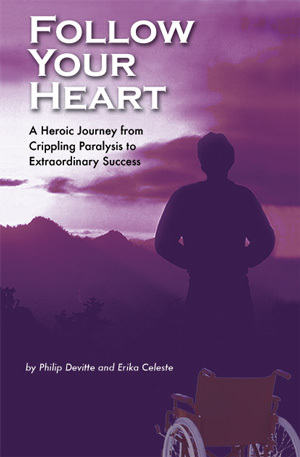 A father of two grown children who has been walking for more than 25 years, Devitte wants to share his story so that others may realize the importance of always following one’s heart and the power of one’s inner spirit.